There is One eternal Waheguru: the creator of the whole universe, the nourisher and the destroyer of all who is forever sat - eternal and found through the prasadh - through the grace of true Guru, the eternal Guru. In this shabad today Sathiguru Arjan sahibjee Maharaj takes on the voice of a humble seeker upon the path of spirituality, upon the path of union to the Lord and asks questions, questions which come across in the mind of a jagiaasu - meaning that soul in whose heart there is jagi - an awakening of aasu - meaning a hope of merging in with the Lord, a union, a yearning for that union, that divine embrace of Waheguru jee, of merging in with Akaal Purakh, with God, with Waheguru. So Gurmukh piaareyo Sathiguru Arjan Devjee Maharaj themselves takes on the voice of the seeker in this shabad today and answers the many questions which run through the mind of those Gurmukh piaarey who walk upon this panth - this path. This is the greatness, the glory of the Guru that the Guru voices themselves - voices all of the questions which go through the mind of the seeker, of the Sikh, of the learner, of the devotee upon this path. Hey Gurujee dhaehu sandhaesaro - please bless me with the sandhaesaro - a message, what message do we want to be blessed with? Keheeao pria keheeao - tell me pria - my beloved Waheguru, keheeao - kehe means where, ao means place of residing. Sathiguru Arjan Devjee Maharaj is talking on the voice of this jagiaasoo and saying Oh Guru Raamdasjee Maharaj, O blessed great Guru, O Siri Guru Naanak Devjee Maharaj please bless me, tell me keheeao - where is my pria - my beloved, where does Wahegurujee reside? This question is asked at the beginning of the shabad and is resolved by Gurujee whilst we go through the shabad. Keheeao - please tell me, please give me that message, please give me that advice upon which I can walk upon Wahegurujee's path. 1. Proksh giaan: when we hear the descriptions. So when we hear the descriptions of an orange that the orange is a certain color, certain texture, has a certain taste - we hear about all of these things. When it comes to spirituality, when it comes to Akaal Purakh Wahegurujee, the Lord God proksh giaan means the holy scriptures of the world, all of the teachings of the world which are telling us and describing to us Waheguru jee. 2. Aprokh giaan: when you actually experience it, when you actually taste it. There can be no parallel to actually tasting it yourself, to that aprokh, to that experience. The descriptions cannot get anyway near that experience. In terms of spirituality this is actually tasting the essence of Akaal Purakh, of Waheguru, of merging in with, of experiencing first-hand the Divinity of the Lord, of Waheguru. Sathiguru Maharaj jee in these lines says I've become bisam - hearing these descriptions in the scriptures, in the teachings I've gone into the state of amazement, of wonder searching for my Lord. Kehahu - please tell me suhaagan seheeao - O suhaagan - O soul brides who are merged in with Akaal Purakh, O God-centered souls, O great saints please tell me seheeao - the true path to merging in with Waheguru, with Akaal Purakh, with Lord God. Rehaao - pause and think about this today, Guru jee says. When I listen to some teachings there are some who say, ko meaning some kehatho means those who say, that Waheguru jee is sabh baahar baahar - that Waheguru is beyond this world, Waheguru jee is inapproachable, that He is infinite, and beyond the limits of this world. Some are singing, some are praising. Ko kehatho sabh meheeao - on the other hand I hear others telling me that sabh - within all, meheeao - within deep inside, pervading through all, permeating through all, Waheguru jee is within all, within the whole creation. Waheguru jee is nivaasee - is pervading through all, is in sarab - is in all. Ghatt ghatt vaasee - where does He pervade through? - through each heart. 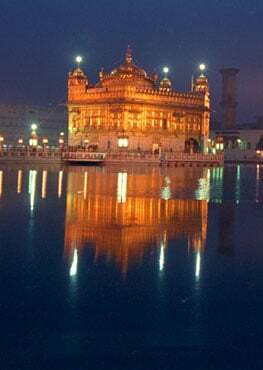 But whilst Waheguru jee is pervading through all of this world laep nehee alapeheeao - even though Waheguru jee is pervading through the high to the low, Waheguru jee is not affected by laep - by the stains of the world, alapeheeao - Waheguru jee is beyond all of the stains of this world, Waheguru jee is that Light who is not sullied, who is not dirtied by our minds. Our minds are the ones which are full of filth, even though Waheguru jee is pervading through all of us He is not touched by that filth. The flame of the candle is burning within a glass container and the glass container may be completely covered in soot but that flame can never be covered in soot, that flame can never be blackened. In the same way that light of Waheguru is pervading through all but is not stained by the impurities of the world. If you want to know the pandheeaa - that path of sukhaao - of peace - they are found in the katharreeaa - in the stories, they are found in the updesh - in the messages of saints. We were asking for a message at the beginning of the shabad - the beginning of the shabad was talking about this message, where are we going to find the message of the Lord? We know that God is pervading through all. It is when Guru Arjan Sahibjee is talking about in the last line is; you were asking for a message, you are asking in the first lines for that path, for that understanding, where does the understanding of God comes from? - the tongue of the saints. Why? Because with their tongue - the saints (there are many things that are coming out of this last line) first start chanting the name of the Lord, whilst chanting chanting chanting chanting chanting - that name of the Lord comes in and abides within their mind, body and soul. But everything comes off from the tongue, by sitting down and chanting Waheguru Waheguru Waheguru Waheguru again and again, again and again, again and again. That Waheguru Waheguru which resides firstly on your tongue, comes to reside throughout your whole body. Santh rasan ko baseheeao - another meaning is that through the rasanaa - through the tongue of the saints is how they give us, bless us with this knowledge that if you want to find, if you want to be enlightened listen to the words of the saints - saint of all saints - Siri Guru Nanak Devjee Maharaj. Listen to the bani of Siri Guru Granth Sahibjee Maharaj, that is the rasanaa - that is the tongue of Siri Guru Nanak. God is pervading through all but we can only be linked to that Waheguru who is pervading through all through the words, through the updesh - through the message of Siri Guru Nanak Devjee Maharaj: the saint of all saints. That is what Guru Arjan Sahibjee is blessing us with today. If you want to feel, if you want to experience that Waheguru Who is pervading throughout the whole creation, listen to the words which flow from the tongue of the saints. Anmrith bachan saadh kee baanee - the bani, the words which flow from the tongue of the saint, of Siri Guru Nanak Devjee Maharaj - the saint of all saints - is the ocean of immortality - is anmirth. That sarab nivaasee - that Waheguru who is ghat ghat vaasee - is pervading through all, He can be found through the rasan - through the words which flow off the tongue of the saints - Santh rasan ko baseheeao.